Primošten Burni is a protected ethno village, featuring traditional stone architecture of the Dalmatian hinterland and still preserving the ambiance of times when people lived only from the fruits of their labour on land. Like many others, this village was largely abandoned when tourism started flourishing on the coast, promising an easier livelihood. However, your entire experience here will genuinely evoke the old times, as your hosts still live this way. This local family has been here for three generations now, and Jadranka, your host, will guide you through their world of harmony with nature, hard work and simple pleasures. All the food you will eat was organically grown and you will prepare it together with your hosts in a small konoba – traditional kitchen with a grill. However, the focus of your cooking class is the art of peka, traditional Croatian cooking accessory and a dish of the same name. In fact, peka is a domed lid to be placed over a pan or stone slab, and covered in burning charcoal. 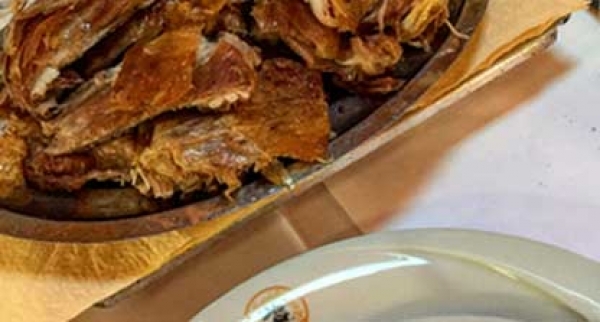 Traditionally, Croatians prepare lamb and veal with potatoes and vegetables under peka, but in Primošten Burnji, you will also learn to knead your own dough and bake bread under peka – a savoury treat. Whilst working, enjoy some typical hinterland appetizers such as prosciutto and cheese, coupled with the authentic local wine sort Babić. Combining traditions with hearty flavours and a genuine welcome, this program has been described by our guests as one of the most authentic culinary experiences in all of Europe! In the picturesque stone village Draga, just a few kilometers from the Adriatic Sea, Baćulov dvor epitomizes authentic Dalmatia and its traditional lifestyle. Everything here is made of stone – even the roofs, and everything here is a fruit of hard labor. Komin – a traditional kitchen – is the focal point of the estate, but delicacies such as prosciutto, wine, olive oil, cheese and dried figs are kept in the underground konoba. The olive mill, completely preserved, is one of the oldest Dalmatian mills, and the votive chapel on the estate is a place to enjoy a moment in silence. If Đina, the very friendly donkey and self-proclaimed host of the estate, allows you, that is.